The new breakfast cereal is claimed to help lower cholesterol with Sanitarium saying it is “clinically proven to reduce cholesterol levels by up to 9 per cent in four weeks”. 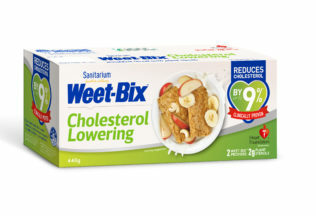 Sanitarium also says it is the first cereal product in Australia to “harness plant sterols to effectively reduce cholesterol levels over four weeks with just two biscuits consumed daily”. The version of Weet-Bix contains plant sterols which reduce LDL, or “bad” cholesterol. Sanitarium conducted a clinical trial involving Australian adults with high cholesterol in 2016 with University of South Australia researchers to confirm the cholesterol lowering effects of the cereal. Chief Executive Officer of Sanitarium Health and Wellbeing, Kevin Jackson, said Weet-Bix have been a nutritious breakfast staple for a long time, but Sanitarium is now taking things to another level. “This new product makes it easier than ever before for Australians to take charge of their heart health,” Jackson said. According to Sanitarium, one in three Australian adults need to manage their cholesterol levels for their heart health. Sanitarium research also found two-thirds of its study respondents do not have their cholesterol tested once every two years as commonly advised by health professionals. The Heart Foundation has thrown its support behind the product with its logo displayed front of pack. For the next 12-months, Sanitarium will hold exclusive permission in the Food Standards Code to include an increased level of plant sterols in cereals. Previously, Food Standards Australia New Zealand (FSANZ) only permitted a maximum of approximately 1 gram of plant sterols in a single serve of food. Researcher from the University of South Australia, Dr Peter Clifton, said the cereal was the most innovative cholesterol lowering product he has seen in 15 years. “While increasing intake of plant sterols is one of the most effective dietary measures to lower cholesterol, getting sufficient amounts in plant foods alone can be difficult,” Dr Clifton said. Weet-Bix Cholesterol Lowering will be sold at major Australian supermarkets from September 2017. The recommended retail price is AUD $5.99 for a 440g box of 24 biscuits. Iconic Australian meat pie brand, Four’N Twenty, is celebrating its 70th birthday. Australians are drinking far less cordial today than they did in 2009 says Roy Morgan Research.